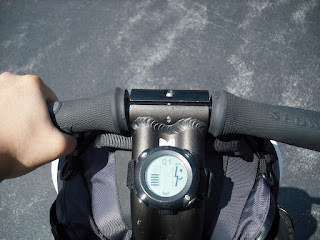 This past week hubby and I had the most delightful summer adventure of a different kind, we went Segway Gliding. That's what it is called when you go for a drive on a Segway. A few years ago at a Health Show I had the opportunity to do 5 minutes of Segway gliding and I fell in love with it. Then a few months ago I came across a local ad for Segway tours in Nova Scotia. I made a mental note and told myself that hubby and I would do this some time in August. Well, last Thursday was that day. It was early in the morning on hot summer's day. We met up with Max from Segway NS at the BLT (Beechville - Lakeside - Timberlea Trail) at trail on what once was the rail bed. What is a Segway Anyway? 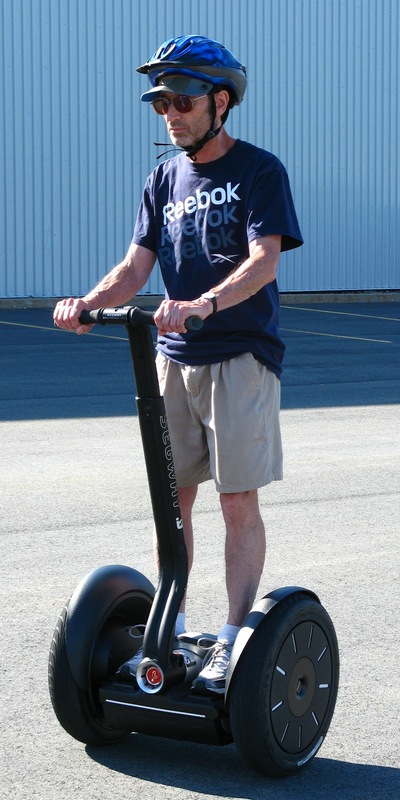 The Segway PT is a two-wheeled self-balancing battery-powered electric vehicle invented by Dean Kamen. It is produced by Segway Inc. ofNew Hampshire, USA. The name Segway is a homophone of the word segue, meaning "smooth transition"; PT denotes "personal transporter". Computers and motors in the base of the device keep the Segway PT upright when powered on with balancing enabled. A user commands the Segway to go forward by shifting their weight forward on the platform, and backward by shifting their weight backward. The Segway notices, as it balances, the change in its center of mass, and first establishes and then maintains a corresponding speed, forward or backward.Gyroscopic sensors and fluid-based leveling sensors are used to detect the shift of weight. To turn, the user manipulates a control on the handlebar left or right. Segway PTs are driven by electric motors and can go up to 12.5 miles per hour (20.1 km/h). This info is from the Segway.com page with a cool animated graphic of a person gliding on a Segway. The BLT trail runs by the Coca Cola plant and we got our basic introduction and training across the street in a parking lot. You step on the Segway that turns it on, then you find your balance. When you are perfectly centered you just stand still. If you are off center forward you will move forward, if the center of gravity is off towards the back you move backward. Now to stand still you just shift your center of gravity until you stand still. Then once you want to move forward you shift your center slightly forward or as I discovered you bend you knees a little and you move forward slowly. The more you shift your weight forward the faster you go. To slow down you just shift more upright again. To make a fast stop just stick you but out. How on earth to you make turns? Well that is very easy. There is a center pole or "LeanSteer" that has handle bars across. To turn right shift the "LeanSteer" gently to the right. To make a tight turn push the "LeanSteer" more towards the right. You can turn 360° almost on the spot. Coming from riding a bicycle I had the tendency to hold on really tight and that is not necessary as you only use the handles to change directions and have some place to hold on to because that's what we are used to. To begin with, Max set our Segways to "turtle mode", that meant the speed was restricted to about 10km/h and the "LeanSteer" was less sensitive. Once we got the hang of it and on the trail we switched to regular mode. The only thing we found with Segway gliding that took some time getting used to is when we switched surfaces at intersection and slight inclines. If there is a small grade upward you have to shift further forward than you think or you will stall in the middle of going up. Once Max felt that we got the hang of gliding on a Segway off we went on the multipurpose trail. The Segway has a wireless info key on the center pole that indicates all kinds of information, I was primarily interested in the speed. At first 10km/h felt quite fast, but by the time we were on our return glide we averaged about 15 km/h. The maximum speed is around 19-20 km/h. If you try to go faster than that you can't as there is a speed limiter and the handle bar starts to push back. Gliding at around 15 km/h on hot summer day was delightful as at that speed there is a refreshing breeze. If you are looking for something different to do I highly suggest doing a Google search to see if you can go Segway gliding in your area. Sadly if you live in Australia you are out of luck as Segways are illegal and not sold there. Marlies Cohen is a renaissance woman, a 'Jack' or should that be 'Jill' of all trades. She is self-taught in most of her subjects due to her strong motivation to learn new things. Everything is touched by an artistic and creative outlook. What looks everyday and mundane to most, is seen in a totally different light by this creative maven who is happy to share her discoveries.